Naperville is a city in the Chicago metropolitan area of Illinois in the United States. In 2006, Money magazine listed Naperville as #2 on its annual list of America's best small cities to live in. The city took the #3 position on the 2005 and 2008 lists. As of the 2000 census, the city had a total population of 128,358, and the population was estimated at 147,779 in 2006. Naperville is the fifth largest city in the state, behind Chicago, neighboring Aurora, Rockford, and Joliet. Approximately 100,000 "Napervillians" live in DuPage County, while about 50,000 reside in Will County." - from Wikipedia: en.wikipedia.org/wiki/Naperville,_Illinois. The city flag is white with city logo on it, as can be seen on photos here: www.naperville.il.us/dynamic_content.aspx?id=7410. "The city was settled in 1830 by Stephen Scott and his family and the Bailey Hobsons, who settled along the banks of the DuPage River. Later in 1831 Joseph Naper, together with his family and friends, arrived at the west bank of the DuPage River to found what would be known as Naper's Settlement. After DuPage County was split from Cook County in 1839, Naper's Settlement became the DuPage county seat, a distinction it held until 1868. Naper's Settlement was incorporated as the Village of Naperville in 1857, at which time it had a population of 2,000. Reincorporation as a city (village) occurred in 1890". 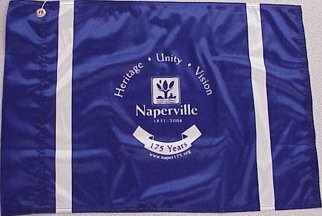 "The present-day logo and flag of Naperville were created by the Community Appearance Advisory Board and dedicated January 21, 1974. The board's goal was to capture the spirit of Naperville and its amenities in a simple, easily recognized way. The large tree in the center of the logo, "symbolizes Naperville's trees, parks and green spaces." The object that appears to be a boat to the left of the tree actually, "represents the low profile of Naperville's housing and industry." The wavy lines below the tree represent water features throughout Naperville, most likely the west branch of the DuPage River. According to a February 6, 2005, article in the Naperville Sun, the steeple-like tower symbolizes the "role played by community churches."" "The present-day municipal code states, "The City Clerk shall seal and attest all contracts of the City, and all licenses, permits and other documents which require this formality. The Clerk shall be the custodian of the City Seal and shall affix its impression on documents whenever this is required." (Section 1-6B-4) Although municipal seals are not required to be registered with the State, the earliest record of Naperville possessing a seal is found in the minutes of the council proceedings, July 28, 1865. Naperville attorney and then City Clerk James M. Vallette submitted a bill in the amount of $6 for the purchase of a "Seal Press for Village." On the Seal of the City of Naperville, two images are prominent: a shield and an anchor. In a memorandum dated March 25, 1996, it was speculated that the anchor "reflects the love Joe Naper had for the sea [and that] his seafaring days ended and his political career began" and the shield, "the days of Joe Naper as an Army Captain." Traditional heraldry assigns the shield as a symbol of protection and the anchor a symbol of hope – both sentiments worthy of a fledgling settlement." The purpose of having a new flag is, among a physical change and update to more modern concepts, the fact that the current flag is "Copyrighted by the city, (and it) is not allowed to be flown anywhere but government buildings." (source: napervilleflag.org). "In 2015, the official TED conference hosted the speaker Roman Mars, who presented the topic: "Why city flags may be the worst-designed thing you've never noticed". Portions of this talk were presented in conjunction with the 2015 TEDxNaperville conference, as part of their Naperville Flag Initiative. Resident Artist Wes Douglas became the conference's official vexillologist, designing flags for all of the talks. Douglas invited conference attendees to submit their own ideas for a new City of Naperville flag at an interactive exhibit, in hopes of spreading knowledge learned at the conference, and inspiring change within the community. "Connor Tenny, a then-sophomore at Neuqua Valley High School in Naperville, IL, saw Roman Mars' TED talk in early 2016. He invited five other fellow students from Neuqua Valley High School sophomore students (Ritvik Manda, Jack Penrose, Haider Sarwar, Nathan Ashta, Andy Wang) to watch it, and then started a campaign, "Campaign for a better Naperville flag" on February 19, 2016 with support from several partners, with this website and this video (source: www.youtube.com), "seeking to revamp Naperville's city flag received rousing support (Tuesday March 2) from the Naperville City Council many of whom agreed the blue city logo on a white background could use some sprucing up and as of As of Tuesday, 20 designs "of very high quality" had been submitted, campaign member Andy Wang said"
The process of selecting a new flag started with submissions of candidates meeting the deadline of August 1st, 2016 (from the original deadline of June 15). Some of the proposals can be seen here (2:07 onwards): www.youtube.com. "Then from sourcing 128 submissions (other sources mention 139: napervilleflag.org/entries) for a new flag design ranging from designers from Norway, England and France, while roughly 70 were from Naperville, right at home, including a few from junior high students who were assigned to create a flag as a class project". "Voting on the flag design finalists started online on the weekend of Aug. 13 and 14 and lasted roughly two weeks (until 11:59 p.m. Aug. 30), and selecting a new, unofficial, flag for the city under Creative Commons, a "non-profit organization for expanding the range of creative works available for others to build upon legally and to share". "The Naperville flag design chosen as the competition winner was unveiled at the TEDxNaperville conference Nov. 4 (www.tedxnaperville.com). Unveiling the flag at www.tedxnaperville.com are Arthur Zards, founder and executive director of TEDxNaperville, and "Campaign for a Better Naperville Flag" team members. "About 400 flags with the new design were distributed this month at the TEDx Naperville speakers conference." The chosen design was made by Austin Schleicher and "shows a tree inspired by the city's official logo, two lines to represent DuPage and Will counties, a blue line to represent the DuPage River, six stars to portray townships (Naperville Township, Lisle Township, Wheatland Township, DuPage Township, Winfield Township and Milton Township within the city and a blue color scheme also reminiscent of the city's current flag. The tree's placement in the center is representative of how the community of Naperville is connected like the roots of a tree." However, "Naperville Communications Manager Linda LaCloche says adopting the flag would bring a cost with it, and "we don't have any resources identified to make a change.""